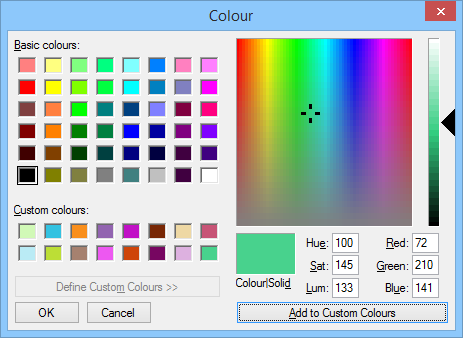 In this article we'll look at the colour selection dialog box. The colour selection dialog box is provided by the ColorDialog class. The dialog provides a set of standard colours, from which the user can make a selection. It can be expanded to show a set of controls that allow selection of colours graphically, or using numeric values and the RGB or HSL colour models. 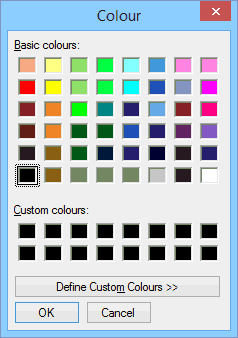 These colours can be added to the selection area in a section for custom colours. The code above creates a new ColorDialog instance when the user clicks the button. The call to the ShowDialog method displays the box, in the same manner as for other common dialog boxes. The conditional statement checks if the user clicked the OK button. If they did, the selected colour from the dialog box is read from the Color property and applied to the form's background. Run the program and click the button to see the dialog box. Try selecting a colour and clicking the OK button to apply it. Note that the background colour is not applied if you use the Cancel button. Next, open the dialog box again and click the "Define Custom Colours" button. The dialog box expands to show a colour picker and some numeric text boxes that allow you to set the colour using red, green and blue elements or hue, saturation and lightness. If you set a colour at the right side of the box, clicking the "Add to Custom Colours" button copies it into the "Custom Colours" section at the left. This area is designed to show a set of commonly used non-standard colours for selection.